(Christian Toto – NewsBusters) Jason Clarke got quite the education after accepting the lead role in Chappaquiddick. 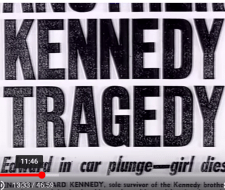 The diver who pulled Kopechne’s body from the car said she didn’t drown instantly. A trapped pocket of air temporarily kept her alive, but no autopsy was performed on the body. Much of this proved new to Clarke, the Australian actor from Terminator: Genisys and Dawn of the Planet of the Apes.